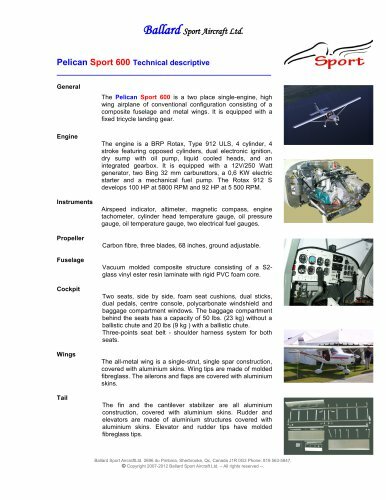 Ballard Sport Aircraft Ltd. Pelican Sport 600 Technical descriptive ___________________________________________________ General The Pelican Sport 600 is a two place single-engine, high wing airplane of conventional configuration consisting of a composite fuselage and metal wings. It is equipped with a fixed tricycle landing gear. Engine The engine is a BRP Rotax, Type 912 ULS, 4 cylinder, 4 stroke featuring opposed cylinders, dual electronic ignition, dry sump with oil pump, liquid cooled heads, and an integrated gearbox. It is equipped with a 12V/250 Watt generator, two Bing 32 mm carburettors, a 0,6 KW electric starter and a mechanical fuel pump. The Rotax 912 S develops 100 HP at 5800 RPM and 92 HP at 5 500 RPM. Instruments Airspeed indicator, altimeter, magnetic compass, engine tachometer, cylinder head temperature gauge, oil pressure gauge, oil temperature gauge, two electrical fuel gauges. Propeller Carbon fibre, three blades, 68 inches, ground adjustable. Fuselage Vacuum molded composite structure consisting of a S2glass vinyl ester resin laminate with rigid PVC foam core. Cockpit Two seats, side by side, foam seat cushions, dual sticks, dual pedals, centre console, polycarbonate windshield and baggage compartment windows. The baggage compartment behind the seats has a capacity of 50 lbs. (23 kg) without a ballistic chute and 20 lbs (9 kg ) with a ballistic chute. Three-points seat belt - shoulder harness system for both seats. Wings The all-metal wing is a single-strut, single spar construction, covered with aluminium skins. Wing tips are made of molded fibreglass. The ailerons and flaps are covered with aluminium skins. Tail The fin and the cantilever stabilizer are all aluminium construction, covered with aluminium skins. Rudder and elevators are made of aluminium structures covered with aluminium skins. Elevator and rudder tips have molded fibreglass tips. Ballard Sport AircraftLtd. 2696 du Pimbina, Sherbrooke, Qc, Canada J1R 0G3 Phone: 819 563-5847. © Copyright 2007-2012 Ballard Sport Aircraft Ltd. – All rights reserved --. Ballard Sport Aircraft Ltd. Ballard Sport AircraftLtd. 2696 du Pimbina, Sherbrooke, Qc, Canada J1R 0G3 Phone: 819 563-5847. © Copyright 2007-2012 Ballard Sport Aircraft Ltd. – All rights reserved --.